Stream and record up to 32 video channels with the 1.5 RU Pro Series Penta-Brid DVR from Dahua Technology at resolutions up to 5MP per channel. 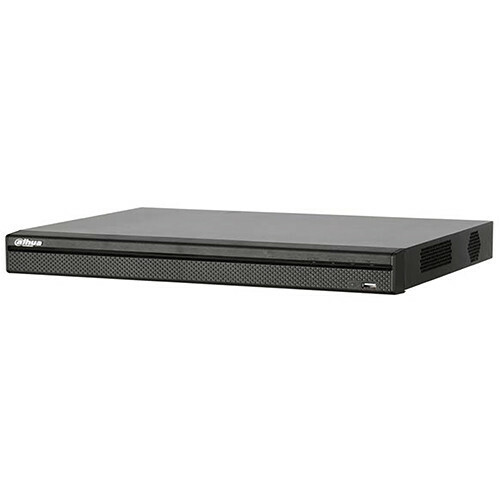 Equipped with four SATA ports, each of which can accommodate an HDD up to 8TB, this DVR supports up to 32TB of internal storage (6TB preinstalled). External storage options include PCs via internet connection, network servers, eSATA drives, and USB storage devices. Network bandwidth is optimized while ensuring high-quality recording and playback using Smart H.264+, H.264, or MJPEG dual-streaming compression. The DVR enables simultaneous live viewing and playback of up to 16 channels via its HDMI, DVI, and TV ports, at resolutions up to 1920 x 1080. Up to 32 channels of HD-CVI, AHD, TVI, CVBS, or IP video can be recorded simultaneously at a maximum incoming bandwidth of 128 Mb/s. Internet connectivity enables remote monitoring via PCs as well as from iOS and Android devices. The DVR is equipped with BNC connectors for bidirectional audio as well as with RS-232 and RS-485 serial ports for PC, keyboard, and PTZ control. Configurable recording options and schedule save HDD space and active monitoring time. The DVR monitors incoming video and can be programmed to record if motion is detected or if an alarm is triggered. The DVR can also be programmed to record on a schedule or at different intervals. Recording options and schedules can be set for each individual camera or copied to all cameras. The DVR provides a spot output channel for a secondary monitor. This monitor allows the operator to view one monitor that is assigned to selected cameras or video inputs from high-security areas. The Smart H.264+ video compression standard can reduce bit rate and storage requirements by up to 70%. The DVR automatically recognizes the incoming signals of each attached camera without any setup. Smart Search allows an operator to specify a region in the playback video to search for a motion detection event. IVS triggers an alarm and takes a defined action when it detects tampering with the camera, an error writing to an onboard microSD card, an error sending or receiving data over the network, and unauthorized access to the camera. In addition to the standard event triggers mentioned above, the DVR offers premium event triggers for one analog channel. For this channel, IVS triggers an alarm and takes a defined action when an object moves through any part of the scene, when a target crosses a user-defined line, when a target enters or exits a defined perimeter, when a person or object moves or obscures the camera, and when a target leaves an object in a designated area or removes an object from a designated area. On the first analog channel, IVS detects and captures a snapshot of human faces appearing inside a defined area within a scene.